as well as bare and packaged magnetic actuators. Littelfuse offers a broad range of magnetically operated sensors, reed switches and reed relays. All are well-proven designs manufactured to our high standards. With a rich history of leading the industry in providing magnetic sensing solutions, our experts are committed to delivering the best products and solutions for your specific needs. The basic reed switch consists of two ferromagnetic nickel-iron wires and a glass capsule. The two wires are formed into "reeds" by flattening one end. The reed ends are carefully aligned with a small overlap and then permanently sealed inside the glass capsule. The overlap or contact area of the reeds is coated with special metals such as ruthenium. The nickel-iron leads are tin plated so that they can be soldered. The two reeds act as magnetic flux conductors when exposed to an external magnetic field from either a permanent magnet or an electromagnetic coil. Poles of opposite polarity are created at the contact gap and the contacts close when the magnetic force exceeds the spring force of the reeds. The contacts open when the external magnetic field is reduced so that the magnetic attractive force between the reeds is less than the restoring spring force of the reeds. The basic reed switch is a Single-Pole, Single-Throw – Normally Open switch, also known as a SPST-NO or Form A switch. By adding an additional nonmagnetic contact that is electrically closed with no magnetic field present, a Single-Pole, Double-Throw switch can be made. This is also known as a changeover switch or a SPDT switch. This is a “break-before-make” switch in that the closed contact opens before the open contact closes. The electrical contacts in a reed switch are hermetically sealed. That is, gas-tight glass-to-metal seals prevent the contacts from being exposed to the environment. Littelfuse reed switches are sealed with an inert nitrogen atmosphere inside the switch. Reed switches are the major component in reed sensors as well as reed relays. Since Littelfuse manufactures both standard and custom reed sensors and relays, applications can very often benefit from our engineering expertise, production capabilities, and quality systems to provide parts in a cost-effective and timely manner. Options include standard surface mount reed switches, custom cropping & forming of leads, modifications to existing standard products, and fully custom products. 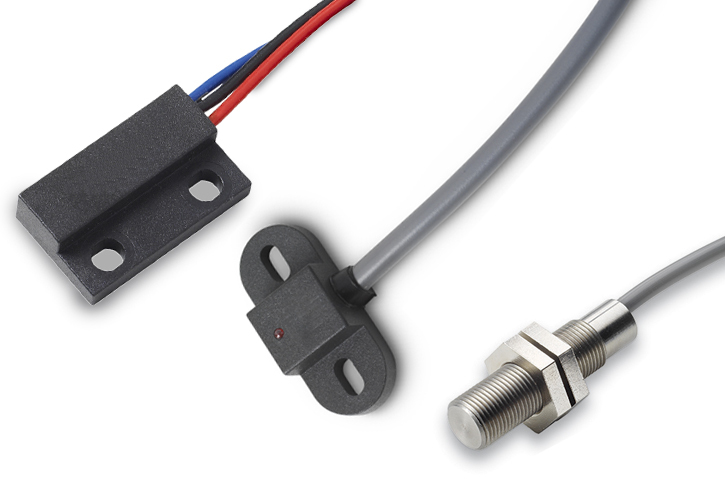 Reed sensors are reed switches that are packaged within an external housing for simplified mounting/connecting and additional protection against environmental influences. These sensors are typically mounted in mechanical systems. A bare reed switch can easily be mounted on circuit boards. However, for an application such as a door security sensor, the reed switch needs a protective shell/housing for handling and mounting. 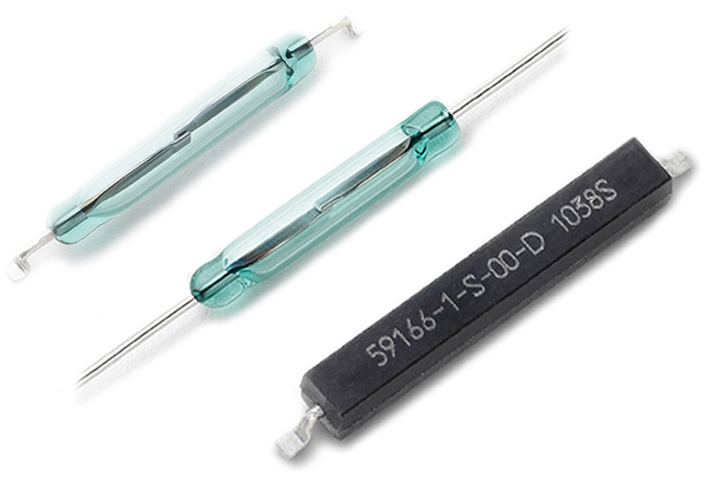 These packages offer resistance to mechanical stress by protecting the bare glass of the reed switch. There are several considerations in incorporating a reed switch into a sensor capsule, such as damage to the reed switch from mechanical shock and change in sensitivity due to mechanical stress. Depending on the type of mechanical shock, the damage can take the form of a loss of the hermetic seal, a change in sensitivity, or no operation due to glass capsule breakage. Fortunately, Littelfuse has much expertise in reed sensors and produces custom as well as standard reed sensors with high levels of quality and reliability. There are many considerations that are the same as for both reed sensors and reed switches, such as electrical switching load, activation methods, etc. Since a reed sensor is a magnetic sensor, ferromagnetic materials such as steel in close proximity to the sensor can influence its behavior. Motors, transformers, and other high current electrical devices near the reed sensor may also cause unwanted influence. Another influence to be aware of is temperature. Both magnets and reed sensors become more magnetic at low temperatures and less magnetic at high temperatures. The amount of change with temperature depends on the type of magnet and reed switch used. 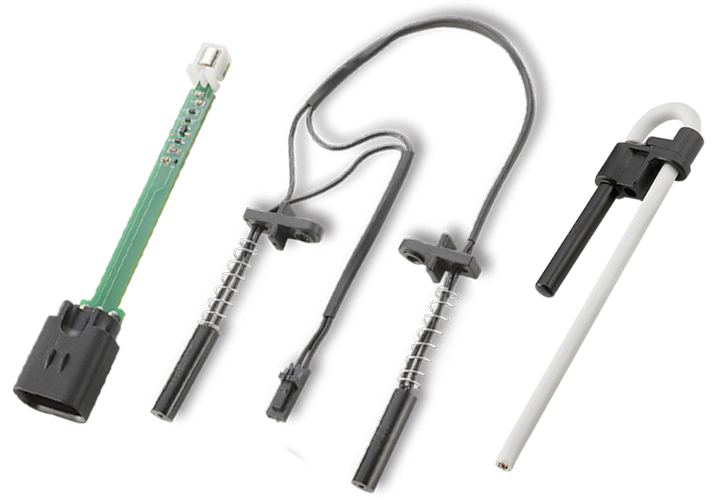 There are many types and options of reed sensors that are available. Sensor capsules may be plastic or stainless steel. Mounting may be with screws or by soldering to a circuit board. Sensors may be placed into a hole and held in place with nuts (threaded barrel sensors) or with setscrews or retaining clips (firecracker sensors). Electrical termination may be for a circuit board, by an integrated connector, or wires may be terminated with connectors, terminals, fastons, or just tinned leads. Although Littelfuse offers a wide variety of standard parts, they cannot fit every application. That is why Littelfuse works closely with customers to provide custom solutions, including additional components such as resistors, triacs, or circuit board related work. A reed relay is made by combining a reed switch with a copper coil. Like other relays, this provides galvanic isolation between the coil input and the controlled contact(s). However, because of the small size and magnetic efficiency of the reed switch, the power required to drive the coil is lower than most other types of relays. Other advantages include high insulation resistance, low contact resistance and long contact life. Reed relays are used in many applications, including automotive, test equipment, security, medical and process control equipment. Compared to other relay technologies, reed relays have the advantages of hermetically sealed contacts, low coil power, fast operation, and small size. However, as with any technology, there are various aspects to consider. Since the reed switch is the switching component used in a reed relay, many technical aspects related to the reed switch, such as electrical load, operate time, contact bounce, and shock & vibration, affect the characteristics and operation of a reed relay. Reed relays are normally mounted to circuit boards. The reed relay terminals should not be bent, for example, to make them self-clinching. Avoid bending the terminals to fit misaligned holes. Unshielded relays placed too close to each other can influence each other. Shielded relays are an option in this case and for environments with high magnetic fields from motors, magnets, etc. Discovered by Edwin Hall in 1897, the "Hall effect" has been around for a long time. It is only since the adoption of semi-conducting materials by the electronics industry in the 1960s that this discovery has moved from an interesting physical effect to one that has found serious practical applications. Today, Hall effect technology enables the design of sophisticated sensors used in a wide range of automotive, electronic, and industrial product applications. A Hall effect device is a semiconductor-based integrated circuit with Hall plates that respond to magnetic fields. Hall effect devices provide digital or analog output signals that are used for proximity and continuous rotary or linear positioning. Unlike a reed switch, a Hall effect device contains active circuitry, so it draws a small amount of current at all times. Hall effect devices come in two- or three-wire versions. Some devices are programmable. Like all solid-state semiconductor devices, Hall Effect sensors have a maximum operating junction temperature. The operating junction temperature is determined by the power (voltage times current) that the sensor is dissipating, the thermal resistance of the package, any heat-sinking effects resulting from mounting configuration, any air movement, and ambient (air) temperature. Because of the internal power dissipation and self-heating, the maximum operating temperature may need to be reduced at higher supply voltages in order to limit the junction temperature to an acceptable value. Semiconductor products are sensitive to Electrostatic Discharge (ESD) events. Always use caution and follow ESD control procedures when handling and operating Hall Effect sensors. Some Littelfuse Hall Effect sensors are provided with internal ESD protection. Littelfuse offers a wide range of magnetic actuators that are packaged in shapes similar to the relative mating sensors. We also offer a limited family of bare magnets with various grades of materials, including ferrite (ceramic), AlNiCo and neodymium iron boron (NdFeB) materials. Refrigerators equipped with a microprocessor control unit are compatible for the use of noncontact-type sensing technologies such as reed switches/sensors and Hall Effect sensors. These technologies are very compatible for the low DC voltage and current requirements of the microcontroller. The typical dryer in past designs had used a mechanical pushbutton switch as the closure switch. However, these mechanical switches within this warm and humid dryer environment can encounter problems with oxidizing contacts at this low switching voltage. Dishwashers are one of the most improved appliances for the kitchen over the last few years. Upgrades include more thorough cleaning/washing cycles while still lowering water usage and energy consumption. Reed sensors and Hall Effect sensors are very reliable and will operate over millions of cycles with long-term integrity when used with microprocessor electrical loads.